There is so little to say about the earthquake that hasn't been said...The vastness of the suffering it has caused is breathtakingly shocking. As a new mother, it is especially unfathomable. My heart breaks for all of the mothers and fathers who have lost children, and all of the children who have lost parents. It is all just too sad for words. Also, see if your place of work--like my husband's-- is matching contributions to double your impact. It's worth checking into. I saw a heartening story this morning about seven-year-old Kiki, pulled from the rubble and then immediately throwing out his arms and flashing this brilliant smile. This beautiful moment was made possible by the brave and selfless people who are working night and day to help. 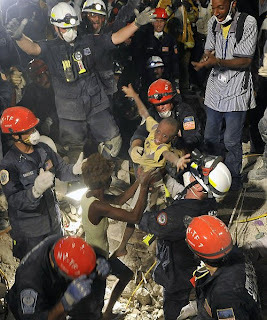 But for every glorious moment of rescue, there are a hundred more profoundly sad moments. If you can't be there to offer your manpower, the next best thing you can do is make a donation. Already made one? Great. Now think about making another. Unfortunately, this is far from over.